Middle drawer: it contains a collection of serial art crafts and corresponds to the negotium where exchanges took place. This drawer can be displaced in different locations from time to time, as a moving platform where the objects are for sales; the relation with the marketplace is therefore signified by a hole. 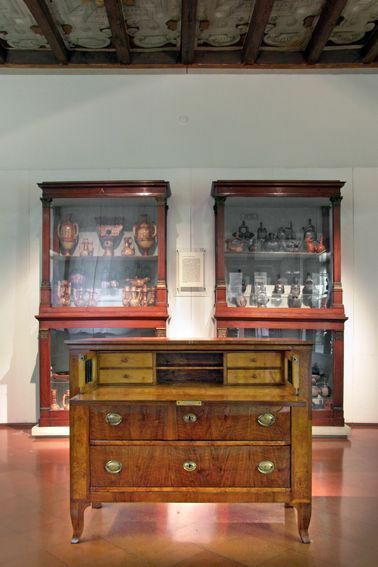 Bottom drawer: it is called secreta and it is the warehouse where the permanent collection is kept together with small personal objects coming from private contributions. It is generally closed but its content becomes visible through a glass window in occurrence of the negotium removal. Outside surface: it has been carved during a public performance where etching tools where offered to the visitors of the neon>campobase gallery in Bologna (Chiara Pergola, Significato, 24/09/2009). This performance was conceived as a sort of christening, but is also referred to Marina Abramovic’s performance Rithm 0 (1974), during which she allowed people to act on her body with different tools of pleasure and torture. Being torture prevaling then and now on human bodies, the founder has tried to “put things back in their place”. Back side: is the technical office, with works of various artists conceived in order to increase the user-friendliness of the museum. Board of OHM: formed by the OHM founders it drives the museum according to the rules specified in the OHM Statute; Massimo Marchetti has been appointed to Art Director for the triennial activity 2009-2012. If you wish to open the secreta, please ask the key for the visit to the reception of the Medieval Museum. For information on the actual position of the marketplace (negotium), please call at: +393334858488.